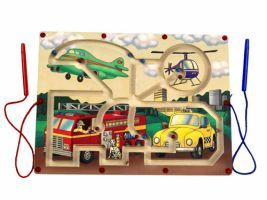 The Magnetic Transportation Maze encourages children to develop eye-hand coordination while having fun! With compelling automobile and aeronautic destinations throughout, kids will enjoy using the attached wand to move the colorful balls through the maze. So encourage your child to fine-tune their motor skills while participating in imaginative play with the Magnetic Transportation Maze. Ages 3+. Includes helicopter, taxi, plane, and fire truck!